This Photo… | No. 9 THORNTON SQ. When a friend of mine heard I was starting this blog about psychiatric misdiagnosis and abuse, she said she had the perfect image in mind for the title page. She was right. 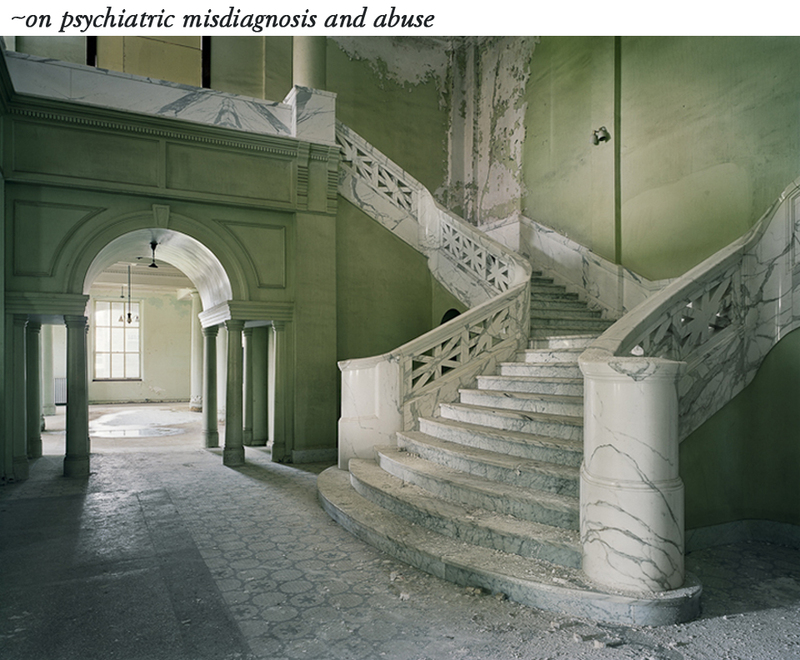 It’s from a book titled, “Asylum; Inside The Closed World of State Mental Hospitals.” It is a haunting and beautiful photo collection of abandoned hospitals around the country taken by the photographer, Christopher Payne. Payne, trained as an architect, is devoted to documenting abandoned and historic industrial architecture around the country. The essay at the front of the books is by Oliver Sacks. I was moved by this haunting and beautiful photograph, taken at Yankton State Hospital in Yankton, South Dakota. It’s powerful simply for the image, the composition that takes you up, takes you out, takes you in, the light and shadows. Payne has captured the monochromatic green color that feels institutional, a bit creepy too. But the photo resonates personally on so many levels. And perhaps it will with you or someone you know as well. There is the hard and veined marble, strong and elegantly carved, still standing after years of neglect, as the building has crumbled around it. Marble is chosen to last, to withstand the weathering of time. It reminds me of the memorials and statues in Washington, DC where I grew up. I remember as a kid taking a field trip with my class to the Lincoln Memorial, and standing in awe in front of Lincoln’s enormous feet, the text of the Gettysburg Address carved clearly all around him. In this photo the cold, marble stairway splits, and goes nowhere. I grew up in a privileged East Coast family. There was the attending expectation (at least from outsiders who couldn’t see behind the glossy veneer) that I would ascend to great achievements: well-married, kids, a full life worthy of a blue blood with a good education and resources. But this was not how my life turned out. Then there is, of course, the fact that this beautiful building has been abandoned. What a stunning first post, Pat. The photo is beautiful in its starkness, but the absence of care is evident. Your words ring so true here! Well-done and long overdue. Will have great impact. Stigma: How Can We Fix It? Forced Incarceration Is A Myth. Says Who?